Garland: is a circular chain decoration of flowers and greenery. 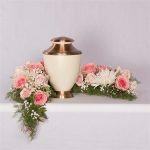 The garland can be wrapped around your loved ones Urn at their Memorial Services. They are also a lovely option on a coffin or casket allowing more room for personal items to be placed.